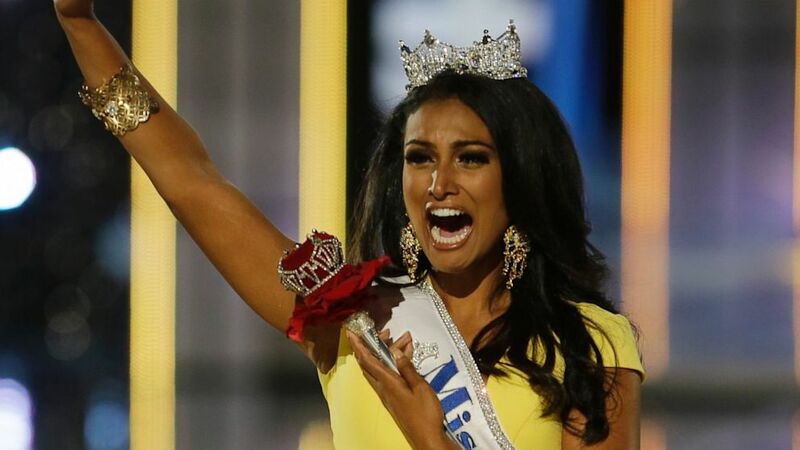 Miss New York: Smoothest armpits in the biz. Congraggulagtions to some lady who got very excited when they called her name at the end. The Miss America pagej has now been won by a New Yorker in back-to-back years which is sort of interesting / not that interesting / kind of really interesting. This however is not the most impressive streak in the competish as the state of Idaho has entered a live buffalo in the pageant for 37 straight years. If I had been paying attention during the contest I could tell you what kind of garb Miss America was wearing for the talent portion or where her heritage is from (India? That looks Indian, right? ), but I am currently on a lot of prescription pain medication so I was kinda mesmerized by all of the shiny sparkles. I can also tell you that the new Miss America has VERY strong feet and I'd love for her to repeatedly kick me in the face, neck, chest and breast area. Lady in Purple aka The Runner Up: "OMG I'm so happy for you jk I will seriously gut you jk this is so great jk I will seriously slice your abdomen off and feed it to a fish jk happy happy happppyyyyyyy!!!!! jk kill me!!!!!! happpyyyy thoughhhhhh!!!!! but stab me with an ice pick but happpyyyy!!!yyyy!!!!yyyy!!!!! deathhhh!!!!!yyyyyy!!!!! sadnessssssss!!!! and smilingggggggg!!!! it hurts so mucccchhhhhhhhappyyyyyyy!!!!"